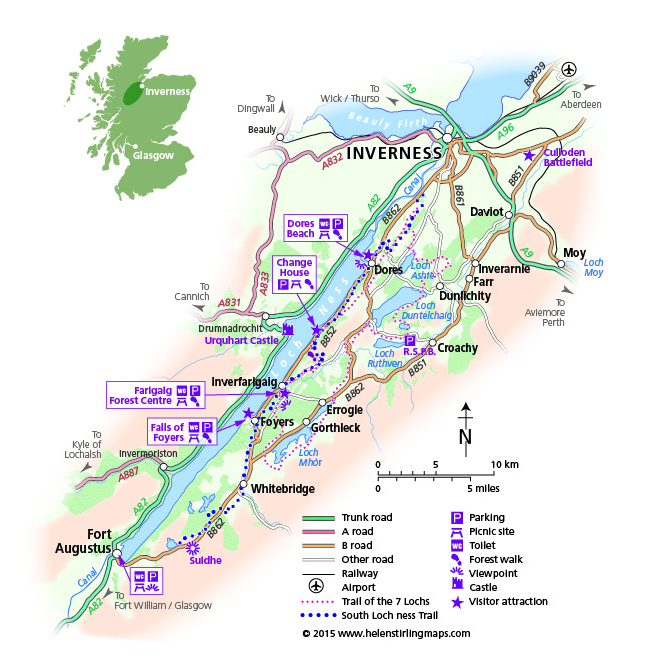 Local map of Loch Ness, Inverness, Culloden, Fort Augustus, Inverfargaig, Dores. The village of Dores provides a dramatically picturesque gateway to South Loch Ness - 22 miles down the narrow loch towards Fort Augustus, with the steep sides of the Great Glen fault rising over 1000 feet on each side. Dores is primarily a very pleasant dormitory village for people whose work is in Inverness. It provides a popular destination for day visitors from Inverness and for tourists from further afield, many of whom enjoy the spectacular walk along the beach and into the woodland around Torr Point. Nestling under the brooding crags of Dun Dearduil, the village is no more than a scattering of homes deep amongst the woods. Yet, in many respects Inverfarigaig represents the very essence of the south side of the loch - wild, beautiful and slightly mysterious. It is a place to relax and enjoy, to be savoured and returned to again and again..
Atop Dun Dearduil are the remains of a timber-laced hill-fort with vitrified stonework dating back to the Bronze Age. The site of this fort is the most spectacular in the Highlands. The area around Inverfarigaig is rich in both wildlife and flora, all of which can be explored using the excellent network of Forest Enterprise walks that cover the area. The largest population of Red Squirrels in Scotland reside here. Many forest areas have woodland walks but few have the diversity of woodland that characterises the Farigaig Forest walks, the sense of wild beauty and, of course, occasional stunning views of Loch Ness. Foyers turns out to be a surprisingly large settlement, and it's easy to wonder why. You find the answer if you park by the white-harled post office a little further into the village. From here a well maintained path leads steeply down forested slopes to a viewpoint overlooking the Falls of Foyers. This is the spectacular 140ft waterfall in which the River Foyers drops into a gorge leading to Loch Ness. The village's name comes from the bridge over the River Fechlin, constructed in 1732. This was built by General Wade as part of a military road in an attempt to suppress further Jacobite risings. A garrison used to be stationed in Whitebridge. The village takes its name from a fort built after the defeat of the 1715 Jacobite uprising. Today, almost nothing remains of the original structure – although some parts were incorporated into the Benedictine Abbey, which dates back to 1876. Today the Benedictine abbey is no longer an abbey but converted into self catering apartments. Much more apparent is the Caledonian Canal, which effectively cuts the village in two. To the north, the canal joins Loch Ness and an impressive flight of locks that cleverly assist the water traffic from one vertical level to another. Originally designed by the famous civil engineer Thomas Telford and opened in 1822, the lock system is part of the 60-mile Caledonian Canal that links Inverness to Fort William. In 2002, the Great Glen Way was opened: a 73-mile route connecting Fort William to Inverness. Fort Augustus is always a popular resting point for weary walkers and cyclists hoping to take a well-earned breather, relax and enjoy the view.